Sorry for the extended delays in posts! It has been a very busy summer, and as you might suspect, my 100 Days of Summer goal has really taken a hit this year. With the bathroom remodel and loads of radios to build, I have just not had the get up and go to get portable. That said, the main goal of the whole event was to get me active, and I have succeeded with that. My wife and I got Fitbit Flex activity trackers and we're both walking extra every day to reach our step goals. So while I may not be operating at the end of my walks, I am getting those steps in and I've already lost 7 lbs this summer, well on my way to my goal weight before our cruise in September. Anyway, that isn't what this post is about after all. 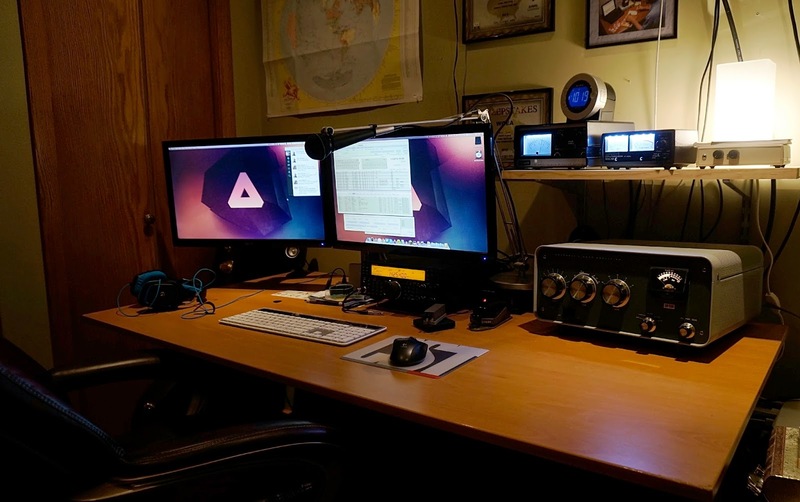 Now that I've got my amplifier set up and running in the shack, I have been struggling to get a clean, efficient, comfortable setup at the operating position. One of the major problems is having access to the connections on my radio. As you are aware, the weather in the Midwest is quite volatile this time of the year so thunderstorms are a nearly daily occurrence. This means lots of disconnecting coaxes. I also find myself wanting to connect another radio to my antennas which usually means I have to pull the 590 out, and unplug stuff. Not any good. The rotor controller and power/SWR meter are on top of the 590, and the cables are barely long enough for me to move them to the top of the amp to pull the 590 out when a storm comes through. It may not be very obvious in the picture but the amp end of the shelf is about 3/4 inch closer to the desk top than the left side. My brackets might be a little unlevel but I think the beast is pulling the shelf down a bit! I decided I'd try to go without the shelf in the new setup. I've been looking at mounting the monitors on an arm for a while but they are typically pretty expensive. As luck would have it, Newegg had a crazy sale on this model. Only $42 with free shipping from Illinois, which I expected would be at most 2 days. Lo and behold, I got a notification shortly after shipping that it would be delivered overnight! Free shipping for overnight? I can't complain! Looking pretty good. Everything is well within reach and I can swivel the monitor out of the way and very quickly remove the connections from the 590 (I put BNC adapters on the 590 for quick RF connections too). Very slick! The only remaining problem is I often have the connections falling off the back of the desk, if anybody has an easy/cheap solution to this, I'd love to know.